This comedy variety TV show was created by comics and talk show veterans Ellen DeGeneres and Steve Harvey. The latter serves as the host and helps show off “the world’s most talented and extraordinary kids”. The series showcases children who have various talents — from young musicians, singers, and dancers to every other form of wunderkind in the country. Harvey goes toe-to-toe with them in humorous conversations and interviews. The talented kids also perform and display their unique talents that amaze the audience. The pint-sized performers seem to prove that talent may indeed be born, not made. What do you think? Do you like the Little Big Shots TV show? Do you think it should be cancelled or renewed for another season? 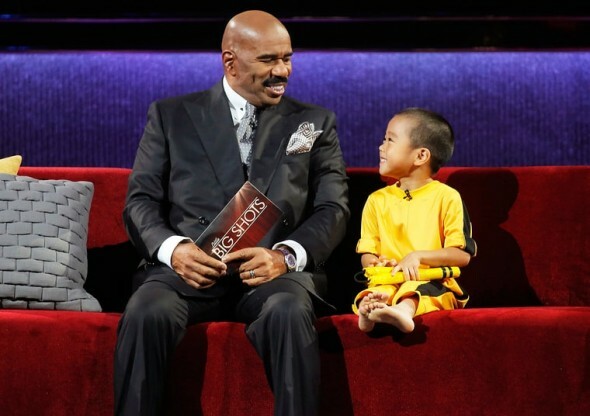 I would like to see “Little Big Shots” renewed. STILL Waiting for Little Big Shots to return!! What Happened?!! We LOVED that show & NEVER missed it. SUDDENLY, it’s off the air. WHY OH WHY, would you take it off?? I’ve been waiting for it to return & can’t find any news that it will happen. Geesh..You get a great show (among so much crap on TV) It goes off & nothing has come close to replacing it. Do not cancel, please! We love the show! Little Big shots is one of the best family shows on TV. I believe Little Big Shots is a terrific show that displays the talent and potential of children at an early age and motivates other youngsters to develop and display their talents as well. I love Little Big Shots. It shows the wonderful talents that our children have and motivates other children to share there talents. It’s a wonderful show. I watch it every Sunday night and hope it is renewed. It’s amazing what some children can do at such an early age.